Since the invention of drawers, people have been utilising the space underneath a tabletop. 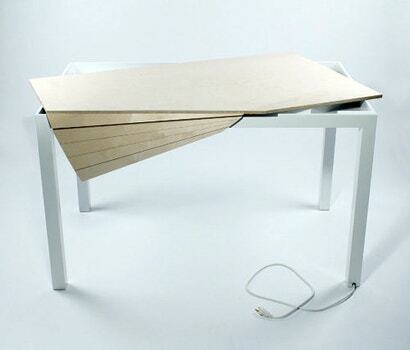 The Tambour Table puts a mind-bending twist on that concept. The table's designer, Michael Bambino, decided to re-think the classic Tambour Door you might find on a old roll-top desk. His variation allows the seemingly solid piece of wood on top to pivot elegantly, revealing cable and gadget storage. Now just sell it already!